Freek Verhoeven is the founder of Royal Grass®. 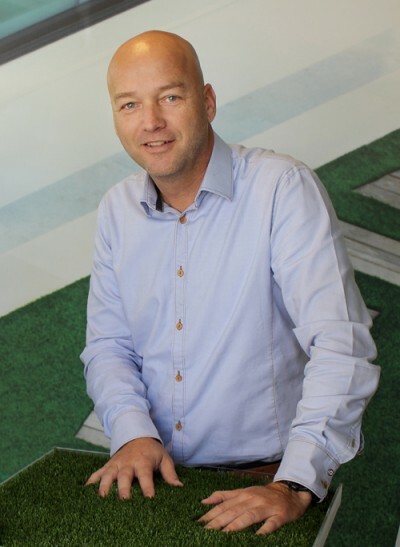 After having worked for TenCate in the USA for many years, Freek saw an opportunity for a new application of artificial grass, namely for private use. Until then, artificial grass was mainly used for sports fields and the grass was developed to meet technical and performance requirements. Nobody had looked into the creation of artificial grass that looked like real natural grass for the landscaping market untill Freek did in 2003. This new opportunity led to the set-up of Landscape Solutions B.V., which started to develop and market this new type of artificial grass specifically designed to be indistinguishable from natural grass. The underlying philosophy was that people increasingly have less time to spend time on maintaining their gardens, yet still want the peace and tranquillity that grass provides. Research showed that people would only consider buying artificial grass for their gardens if their neighbours wouldn’t be able to tell that it wasn’t real. 2003 marks the beginning of a journey to develop the most natural looking and feeling artificial grass. The first type of Royal Grass® artificial grass was made from a combination of two carefully selected hues of green, with a lighter colour giving a contrasting effect. This made the grass look less homogeneous and more natural. Looking at real natural grass, Freek noticed that there was a V-shape that kept the grass fibers standing upright. The best way to explain how this works it to take a piece of normal paper and fold it. This way you can position the paper on a flat surface and it will stand upright. This wouldn’t be possible without folding the paper. Also he found that the nerves running lengthwise on grass fibers should be copied to artificial grass. His vision was that this technology would give artificial grass less glare. There is never a dull moment working for the Royal Grass® brand; building a worldwide partner network and working with likeminded people gives everybody under the Royal Grass® flag a lot of positive energy. Solving peoples’ challenges with their outdoor living space or giving them a better quality of life is what gives us all great deal of satisfaction in our daily job. Royal Grass® is powered by motivated, involved and passionate people. Many of them work in production, transport, our head office in The Netherlands and out on the field, installing many beautiful Royal Grass® artificial grass projects worldwide.